When we think of bankruptcy we always think of material bankruptcy. Someone went broke. Someone had money, and they don't any more. Bankrupt. What we never think of is spiritual bankruptcy. We never ponder that we are all bankrupt. "What?" You ask? "I have money in my bank account and my bills are paid." No, we are born sinners, bankrupt of the spirit that we need to come into alignment with Jesus, which is the spirit of repentance for our sins. His glory is that men respond to His call for repentance and come out of spiritual bankruptcy because of His grace and mercy. It is the highest act of a Holy God to redeem men. Sadly, we live in a time when there is much material bankruptcy but also much spiritual bankruptcy. There is spiritual bankruptcy in the church. The Prosperity Gospel, also known as Name it-Claim it, the Health-Wealth Gospel or the Word of Faith Gospel, permeate today's Laodicean Church of America. The Prosperity Gospel is spiritually bankrupt. I wrote a blistering essay on the view Jesus holds of the last church in the Church Age. We are in that phase now, and it is called the Laodicean Church. I wrote about what Jesus says of this church, here. Jesus said of this last church they will say "I am rich, have become wealthy, and have need of nothing’" This is a direct quote of what Jesus said the last church will say of themselves. He abhors this church. He vomits it out of His mouth. (Revelation 3:14-22). How did we get here? What happened? "I believe that it is anti-Christian and unholy for any Christian to live with the object of accumulating wealth. You will say, “Are we not to strive all we can to get all the money we can?” You may do so. I cannot doubt but what, in so doing, you may do service to the cause of God. But what I said was that to live with the object of accumulating wealth is anti-Christian." Prosperity Gospel is nothing new. But our response to it, is. Hearken to a warning from even further back. Jesus' warning of the Laodicean Church was not only condemning a general attitude of the last church in the Church Age, but was a letter to an actual church in 90AD. It was read at the church in Laodicea. It is real. Jesus warned the actual Laodicean Church that accumulating wealth for wealth's sake will lead to them being blind, poor, naked and unrighteous. By poor, I believe He meant poor in not having the treasure of Jesus as the primary consideration of their heart. 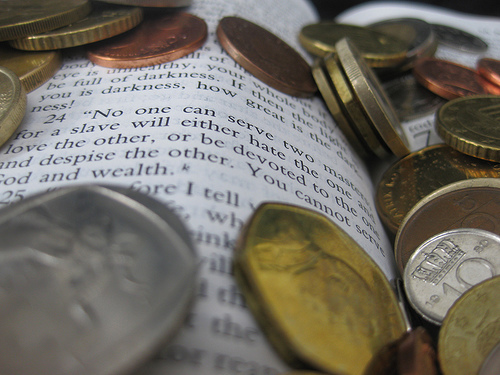 We receive other biblical warnings about the gangrenous effect of replacing the treasure of Jesus with the idol of money. The Holy Spirit causes James to write that the rich will weep. There is no getting around that. The rich will weep. They will howl. They will be miserable. Not that money is bad, but look what the verse goes on to say they did with it: they accumulated it in the last days. They defrauded. They cheated honest workers. Do we see these conditions now? Yes. So that is the second verse that shames and condemns the church that trades spiritual treasures for material wealth. Revelation 3:14-22 tells us, James 5:1-6 tells us. And now Jesus tells us in Matthew the same warnings. In Matthew 13:22, Jesus explains the parable of the sower. He says, "Now he who received seed among the thorns is he who hears the word, and the cares of this world and the deceitfulness of riches choke the word, and he becomes unfruitful." The deceitfulness of riches chokes the Word. In Matthew 6:19 Jesus warns, "Lay not up for yourselves treasures upon earth, where moth and rust doth corrupt, and where thieves break through and steal:"
Paul warns Timothy, in 1 Timothy 6:10: "For the love of money is a root of all kinds of evil, for which some have strayed from the faith in their greediness, and pierced themselves through with many sorrows." Focusing on wealth makes us stray. It chokes the word. It makes us howl. It produces misery. And if we pursue material wealth at the expense of Jesus and to the exclusion of Jesus, we will be vomited out His mouth. Money is good and useful for advancing the Kingdom of God. It is great for showing the love of Jesus through giving to our neighbor. But if we accumulate it, hoard it, gain it by deceptive means, we succumb to its inherent evil, because then money has been separated from its intent: to show the glory of Jesus. Be warned. Revelation 18:4-5 is the end of the end of the prosperity gospel. It is last chance Texaco, the bitter end of the sin of riches come to full fruition. See, even as the harlot economic Babylon is almost at her final moment, in His mercy He still calls us out of the deceitfulness of her riches! But then the damnation comes. It is where this has all been leading since the American Prosperity Gospel polluted the American church in the twentieth century, since Charles Spurgeon warned us not to accumulate riches in the nineteenth century, since Jonathan Edwards preached against ministers accumulating wealth at the expense of their charge of lost souls, since satan in the garden tempted man with the notion that satan has more to offer than God does, we have been chugging down this road. It all ends in Revelation 18. "In the measure that she glorified herself and lived luxuriously, in the same measure give her torment and sorrow; for she says in her heart, ‘I sit as queen, and am no widow, and will not see sorrow.’ Therefore her plagues will come in one day—death and mourning and famine. And she will be utterly burned with fire, for strong is the Lord God who judges her." (Rev 18:4-5, 7-8).